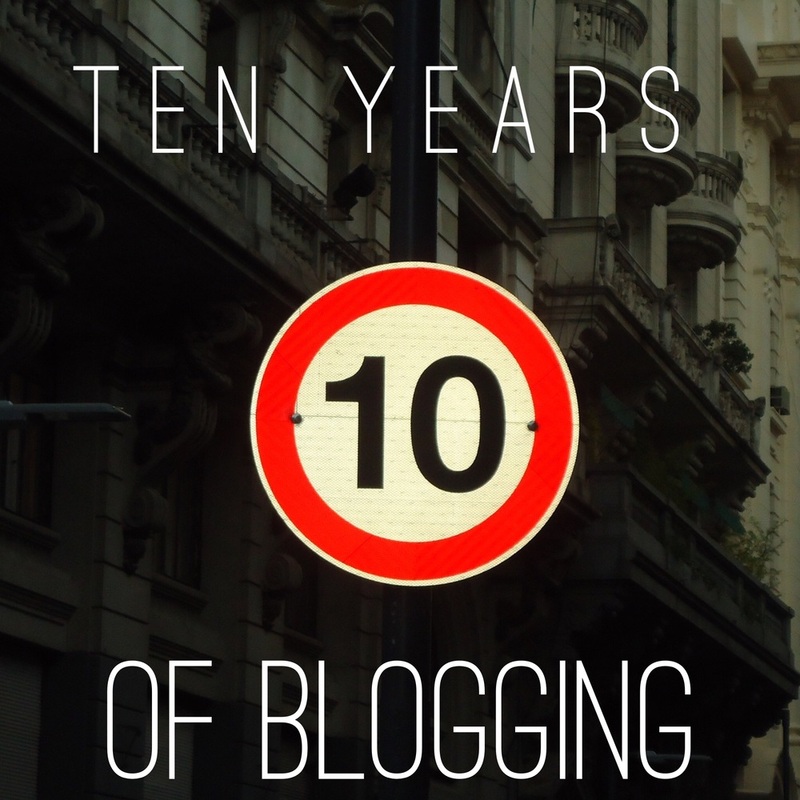 As of October 15th, I've been blogging for ten years! How many people do you know that have been blogging that long and are still going? I bet you can count them on one hand, maybe two. Some say blogs are dying, but I know many of my readers still love to read blogs and are sad that they can't find more that are regular at posting. When I started blogging, I didn't even really know what I was starting. In reality, I had been trying to blog for years because I had a little website that I would try to update each day for a few years. Nobody used the term "blog" back in those days (the early 2000s) that I knew of. I sort of stumbled into the idea in the fall of 2005 when part of a scrapbooking site I hung out on - and now I can't remember the name of it as it closed the following year - offered free blog accounts. I opened one up and started posting about digital scrapbook supplies I found. I had just discovered digital scrapbooking a few months earlier and it wasn't so easy to find designs back then. There weren't a lot of stores and sites and everyone shared a lot of freebies and resources. By the end of 2005, I opened a blogger account and set up my own Katie the Scrapbook Lady weblog. I stayed with blogger for a few years and then moved to typepad for a long time. I tried tumblr for almost a year (hated that) and now I've found my favorite blogging platform at squarespace. It's been a journey and I've changed so much over the years. So have my posts! Many of them are old and irrelevant now. Some of them still sit in a Word file on my hard drive waiting for me to put a modern twist on them. Ten years is a long time. This is what my family looked like back then. My long time readers have watched us grow up over the years. Now we are all adults! My son is 22 and my daughter is 19. My husband and I are older too. lol! Here we are at the end of last year. What has been really interesting to observe is how much technology has changed over the past ten years and the impact that has had on scrapbooking and photography. I didn't own a laptop computer. We had one desktop computer in the house that we shared. I'm not even sure what kind it was (a Dell I think) as I didn't have knowledge of those type of details back then. I wish I would have documented what programs I was using and what version of Windows I was running. I know that when I got my first laptop in 2006, it had Windows XP installed and that was quite an upgrade. I used Microsoft Digital Image Pro for my digital scrapbooking. I had never used an Adobe Photoshop or Elements program. My camera was a 4 megapixel Sony Cybershot point and shoot. I carried it in my purse everywhere I went and that was considered pretty unusual back then. There were no iPhones - those didn't come along until 2007. I had a very cheap cell phone that we only had to pay for if I used it so I never used it. It was just for car emergencies. I had never heard of a podcast, or an "app" or "pocket scrapping" or Project Life. I had never heard of anyone taking a photo every single day. I had never heard of Facebook or Twitter or Pinterest or Instagram. There were blogs, websites, and message boards. There were a few online galleries. There were magazines about scrapbooking at the grocery store. There were even some magazines about digital scrapbooking! LOST was in it's second season, the first Harry Potter film came out in theaters, George Bush was a the beginning of his second term as President of the United States, and Brad Pitt and Jennifer Aniston got divorced. A whole lot has changed since 2005! It's been so interesting to be a memory keeper during these past ten years and I'm extremely grateful for everything my blog has helped me to learn about and experience. Even with everything that is different in the year 2015, the bottom line is that I'm still blogging about the same things. I love to write about my life, my family, and my passion for documenting and sharing memories. I can't imagine that will ever change!